The escapades of the barber Figaro, originally popularised in the 1775 trilogy of plays by French dramatist Pierre-Augustin Caron de Beaumarchais, have received musical treatment from several world-class composers. However, Gioachino Rossini's operatic dramatisation of the first play, Le Barbier de Séville, has stood the test of time most impressively. Its agile melodies and side-splitting humour will awe audiences this season at Venice's Gran Teatro La Fenice. When Rossini started composing The Barber of Seville in 1815, based on an Italian libretto by Cesare Sterbini, he was well aware of Figaro's musical baggage. Mozart had turned Beaumarchais's second play into the wildly successful The Marriage of Figaro in 1786. More pressingly, fellow Italian Giovanni Paisiello had adapted the first play into his own Il barbiere di Siviglia in 1782. Out of deference to Paisiello, Rossini obtained permission from the senior composer to proceed with the project. He even titled it Almaviva, ossia L'inutile precauzione (Almaviva, or the Useless Precaution) to avoid a direct clash, but to no avail. 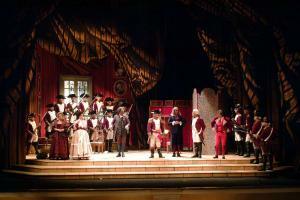 At the premiere in Rome's Teatro Argentina on 20 February 1816, a host of Paisiello supporters booed continuously. The cast's lack of preparation and technical issues added to a disastrous first performance. However, the very next performance went swimmingly, unperturbed by hecklers or set malfunctions, and soon Rossini's opera became the one and only one the world recognises as The Barber of Seville. The opera follows two lovers, Count Almaviva and Rosina, who face a crisis as Dr Bartolo is plotting to marry the young lady. The clever barber Figaro who frequents Dr Bartolo's home comes to their aid and applies all his wit and trickery in order to foil the doctor's plans and help the young pair get together. Hilarity ensues in every scene. Rossini's The Barber of Seville has truly stood the test of time thanks to the composer's fantastic score. Known for his efficient working process, he is rumoured to have completed writing on the opera in less than three weeks. The overture famously comes from Rossini's earlier works Aureliano in Palmira and Elisabetta, regina d'Inghilterra. Perhaps the most famous aria in all opera, however, marks the entrance of the mercurial barber Figaro: 'Largo al factotum' and its numerous calls of "Figaro! Figaro! Figaro!" set the tone for this masterpiece of operatic comedy. The work's memorable melodies, humour, and high energy do not let up until the happy ending!